Steve met his beautiful wife Lisa, the summer before his last semester in seminary. The following year in September, 94’ she and Steve were married and she became not only his wife, but also his partner in Ministry. One of the things that pastors love about Steve, is his varied avenues of ministry. As a preacher, singer, musician, and song writer, Steve uses all his gifts to introduce the lost to Jesus and to encourage the body of Christ. Steve is an encouragement to my soul every time I see him. 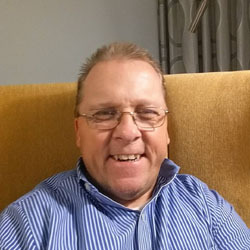 Faced with some physical disadvantages, Steve has determined across the years that no one would ever hear him complain about the grace of God. 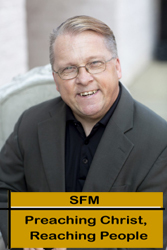 Steve Freeman Ministries: It is hard to believe that I am in my 25th year in Full Time Evangelism. I hope each of you had a wonderful summer and are enjoying God's blessings. We are having a great ministry year and God is blessing in many ways. Our daughter Berkeley just moved in at Liberty University and will begin classes on Monday. I am so thankful for that opportunity and know that God will do great things in and through her. How am I old enough to be the parent of a college student? I appreciate your prayers for our family as we start this new chapter in our lives. God is so good and is keeping me on the road and very busy. I am so thankful to be able to serve the Lord in this way. Every year is different, but I am so thankful for every opportunity God gives me to proclaim His goodness and love to a world that needs Him so. While there are many uncertainties in this world, one thing I do know is that God is still saving and changing lives, and I pray that this will be our greatest year of ministry. Ministry Update: This has been a great year so far with many wonderful ministry opportunities. It is hard to believe it is already the end of August. It will not be long...and we will be preparing for Thanksgiving...then Christmas...and then before you know it...we will be in 2019. We have a very busy fall schedule so far with many wonderful opportunities. The Lord has been very gracious and we have seen Him change many lives for His glory. 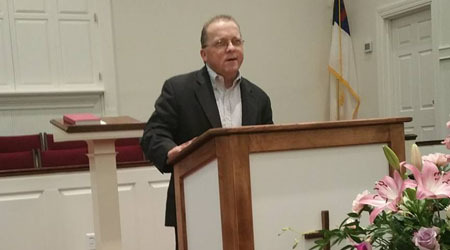 As are summer begins to wind down and I am preparing for a busy fall and also scheduling for next year, I pray that each revival, concert, testimony service, school assembly, camp, retreat, harvest day, banquet, or one day special event will be fruitful for the Lord. It has been a great year of ministry so far...and I am so grateful for each of you who lift us up to the Lord in prayer and financially support our ministry. Thank you all so much! Health Update In 2009 I was diagnosed with Testicular Cancer. I have said many times that I always beleived that having Cerebral Palsy was enough...I felt like I didn't need any other physical challenges or difficulties, but apparently God had other plans for my life. I am so humbled and blessed to be able to say that I finished my last Chemotherapy treatment in December, 2009. Cancer touches so many families and I am so blessed to be where I am today. I am feeling good and the doctors say that there is no evidence that there is any cancer in my body. My doctors have monitored my progress very carefully and I am thankful for them. I have seen God use my cancer diagnosis as a means to be able to share God's love with so many precious people who are battling cancer at this time. I don't know what the future holds, but I pray that I will be faithful to exalt Jesus no matter what. I appreciate your prayers for my continued health and strength. We are so grateful for you who partner with us in ministry with your prayers and financial support. You continue to encourage us and enable us to impact the world as we continue Preaching Christ, Reaching People. At the age of nine, he began to understand a little more about God’s love, and he realized that he needed to be saved. He walked down the aisle of his church the best he could, and invited Jesus into his heart.